Survivalists prep for disaster by stocking up on emergency food rations. Aliens, on the other hand, might hoard stars. To offset a future cosmic energy shortage caused by the accelerating expansion of the universe, a super-advanced civilization could pluck stars from other galaxies and bring them home, theoretical astrophysicist Dan Hooper proposes June 13 at arXiv.org. It’s a far-out idea, tackling a dilemma in a future so distant that human beings can hardly fathom it: 100 billion years from now, each neighborhood of the universe will be marooned as if on a cosmic island, with resources from the rest of the universe inaccessible. “We’ll be in this very dark, lonely place where we won’t be able to see other galaxies,” says theoretical astrophysicist Katie Mack of North Carolina State University in Raleigh. That isolation is thanks to a mysterious “dark energy” that is causing the universe to expand faster and faster (SN: 4/7/01, p. 218). 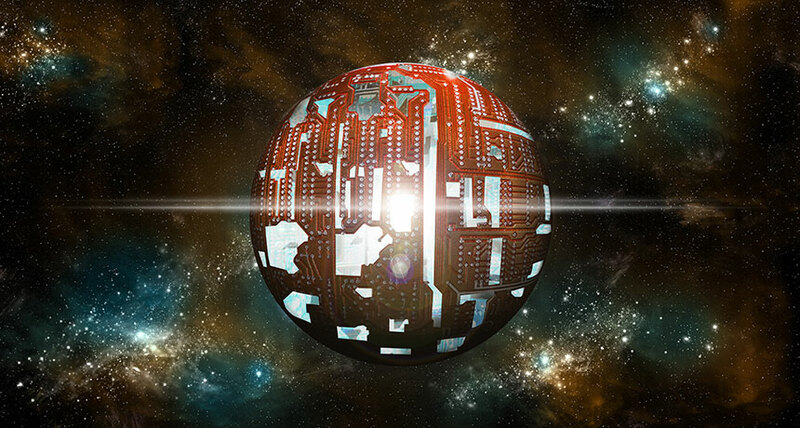 Advanced societies might be able to harness the energy of stars by surrounding them with giant, hypothetical structures called Dyson spheres (SN: 4/24/10, p. 22). But the expansion will eventually make it impossible to reach stars outside the civilization’s home turf. Aliens that possess such technology might want to maximize energy reserves by sending spaceships to retrieve stars before the cosmic isolation sets in. Each star’s energy could be captured with a Dyson sphere, and that energy would then be used to propel the star homeward. The effort would do best to focus on stars that aren’t too big or too small, Hooper calculates. Big stars live fast and die young, so during the tens of billions of years needed to transport the stars home, they would fizzle out. The least massive stars, on the other hand, wouldn’t emit enough energy to fuel their own propulsion; they wouldn’t be able to outpace the universe’s expansion. We have no evidence that such an advanced civilization exists (SN Online: 1/3/18). But if aliens are harvesting stars, says Hooper, “this would not be a subtle activity.” Scientists might be able to spot signs of the stars being propelled across the universe. A dearth of certain types of stars in particular cosmic neighborhoods would also be a tip-off.